Well, here Jakob is with his 3rd pair of glasses! Jakob's first pair of glasses are still around, a bit beat up, but still usable. They are much too big for him and slide down when he looks down, but they work. He has been wearing those ones to school and around the house for the past couple weeks. We got Jakob's a second pair of glasses that we thought he could wear to church and have on hand as a "just in case" pair. 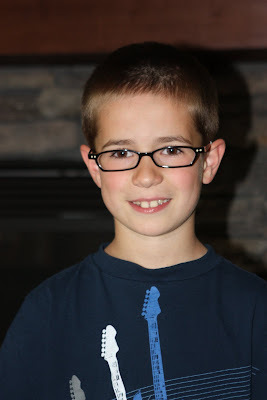 Jakob preferred those glasses and wore them the most, even to school. He came home from school one day (a field trip day) and one of his lenses had popped out and they couldn't find it. I called the place where he had the field trip, thinking they might be able to locate the missing piece, they laughed at me. Oh well. After talking to some of the other mom's who have kids with glasses, this seems to be very normal. Most are on their 3rd or 4th pair this year. Jakob is the kid who lost 8 pairs of mittens this year, so I'm just waiting for the day when he loses his glasses completely. That being said, he does look really cute in these ones! That is funny and painful all at once!